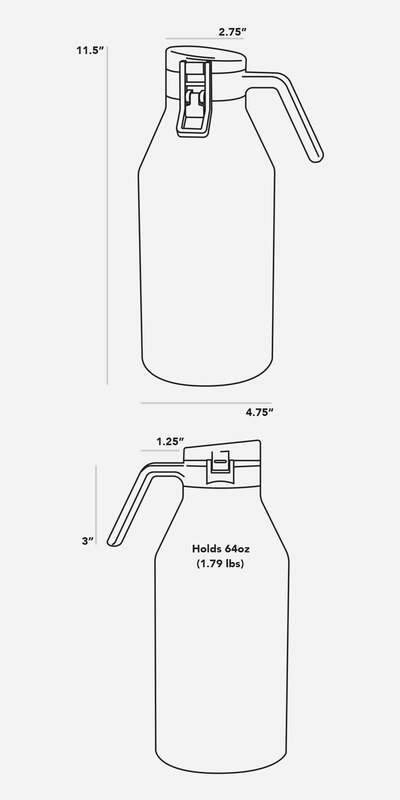 Bring the party with you with the 64oz MiiR Vacuum Insulated Growler. Featuring a buckle lid that locks in place when open and a handle for easy carrying on the walk home from the brewery or pouring a few pints for your friends. Our four pint (64oz.) growler keeps your beer cold for 24+ hours. Need to keep something hot? It keeps drinks hot up to 12 hours too. Reward your drinks by picking up the King of Insulation. This growler exceeds all my expectations. It completely seals the beverage inside of it and keeps it fresh and cold. It is easy to pour from and it is easy to clean. This is an attractive well made growler that works for all beverages. Keeps liquids cold and seals nicely. I like it. Easy to clean , wonderful durability and color, and easy to clean ! It keeps beer at the perfect temperature and fresh as the day it was filled !